Sofitel Royal Angkor Phokeethra Golf & Spa Resort, Siem Reap sits in spacious tropical grounds with an ornamental lake, and boasts fantastic facilities. Managed by trusted French group Sofitel, impeccable service and fine cuisine come as standard at this resort-styled luxury hotel. Between the town of Siem Reap and the fabled temples of Angkor, approx. 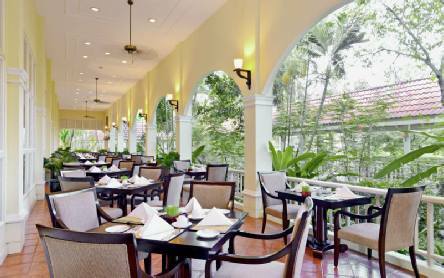 15 minutes from Siem Reap airport. 238 elegantly designed rooms each with air-conditioning, television, complimentary Wi-Fi, minibar, bath and separate shower. Superior Rooms as described with either pool, lagoon, village or garden views. Larger Luxury Rooms include a terrace or balcony with either pool, lagoon or garden views. Take a sip in the large freeform pool, hit the fitness centre or savour a blissful treatment at the spa. Golf enthusiasts can tee off on the resort's world class 18-hole course. Three restaurants and two bars offer cuisine ranging from French - Khmer fusion to Western dishes. 2019 Package holidays to the Sofitel Angkor Phokeethra Resort Siem Reap Cambodia Prices are per person based on two sharing.